Point Park University is a Lynda.com Campus and provides all students and employees access to Lynda.com, an online subscription library that teaches the latest software, creative, and business skills through high-quality instructional videos. 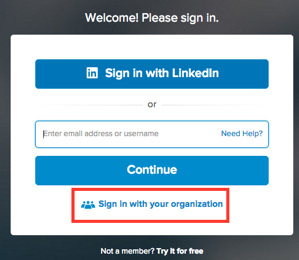 To learn more watch the How to use Lynda.com course or log in using the instructions below. The materials can help teach new skills, augment class work, provide extra help on course materials and provide an avenue to earn competency certificates that will plug in directly to personal LinkedIn profiles. 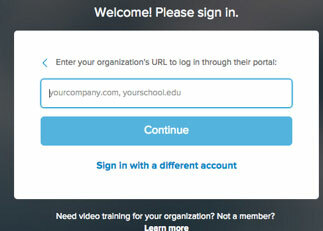 Navigate to Lynda.com and select "Sign in with your organization"
Type "pointpark.edu" and select "Continue"